A little more than 48 percent of homes nationwide have exceeded their pre-recession value. In Denver, Dallas, Nashville, Portland, Raleigh, Louisville and San Jose, more than 90 percent of homes are now worth more than they were in 2007. According to Zillow’s July Market Report, nearly 50 percent of homes nationwide have regained or exceeded their 2007 pre-recession value. In seven of the 50 largest metros, more than 90 percent of homes have exceeded their pre-recession Zestimate peak values. Denver took the top spot with 99.5 percent of homes exceeding their 2007 value, followed by Dallas, Texas (97.3 percent); Nashville, Tennessee (96.8 percent); Portland, Oregon (94 percent); Raleigh, North Carolina (93.8 percent); Louisville, Kentucky (92.5 percent); and San Jose, California (90.8 percent). Denver’s latest Zillow Home Value Index (ZHVI) is at $371,100 — 57.3 percent above its April 2006 peak of $235,900. Dallas’ ZHVI rose 42 percent from its 2007 peak to $212,500, and Nashville experienced a 40 percent boost from its 2007 peak to $221,600. Lastly, San Jose ZHVI jumped 37.8 percent from its 2007 peak to a whopping $1.3 million. But not all areas have fared as well since the recession. Las Vegas is at the bottom of the recovery list, with a minuscule 0.4 percent of homes exceeding their pre-recession Zestimate peak value. Less than 10 percent of homes are worth more than they were in 2007 in Riverside, California (2.9 percent); Orlando, Florida (3.5 percent); Hartford, Connecticut (4.5 percent); Phoenix, Arizona (5.1 percent); Jacksonville, Florida (7.7 percent); Miami, Florida (8.2 percent); Providence, Rhode Island (8.4 percent); Sacramento, California (9.1 percent); Chicago, Illinois (9.2 percent); and Virginia Beach, Virginia (9.3 percent). Zillow Chief Economist Svenja Gudell predicts that the tides may change, especially in the areas that experienced record ZHVI growth, as home value growth begins to slow down. Gudell points to July’s 6.8 percent year-over-year existing-home sales price growth, which is down from the 7.2 percent year-over-year growth seen only a month prior, as evidence that home prices may finally begin to dwindle. 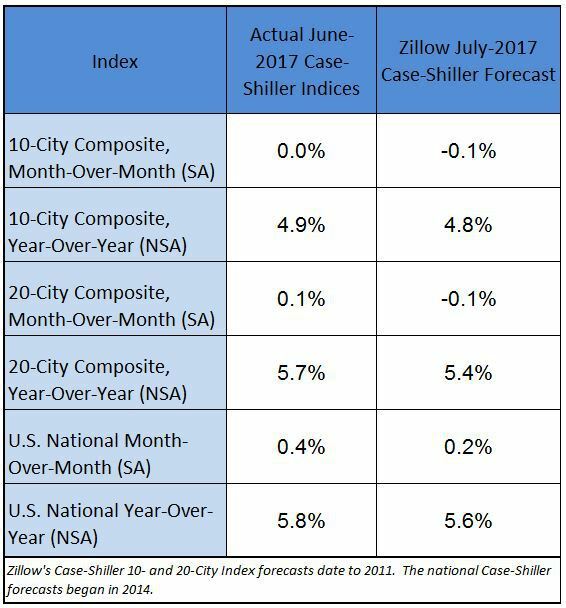 Furthermore, Zillow’s latest Case-Shiller Forecast showed small decreases in the month-over-month 10-City and 20-City composites. Although buyers would like to see a slow down in home prices as Zillow predicts, the actual July S&P Case-Shiller Indices don’t show lowered home prices coming anytime soon. The 10-City and 20-City composites experienced 0.7 percent and 0.9 percent month-over-month growth, and the national index rose 0.9 percent month-over-month to 192.60. “The trend of increasing home prices is continuing,” said S&P Dow Jones Indices managing director and chairman of the index committee David M. Blitzer in a statement. “Given current economic conditions and the tight housing market, an immediate reversal in home price trends appears unlikely,” he added.